An automobile, motor car or car is a wheeled vehicle used for transporting passengers, which also carries its own engine or motor. Most definitions of the term specify that automobiles are designed to run primarily on roads, to have seating for one to eight people, to typically have four wheels, and to be constructed principally for the transport of people rather than goods. Larger cars can often carry six, seven or more occupants depending on the internal arrange of seats. Sports cars are often designed with only two seats, and very occasionally three seats. The differing needs for passenger capacity and their luggage has resulted in a large variety of body styles to suit personal requirements such as the sedan, hatchback, station wagon/estate and Multi-Purpose Vehicle or Minivan. Cars are driven by an internal engine, which can be a conventional combustion engine running on gasoline, gasoil, LPG or LNG. Efforts to improve or replace existing technologies include the development of hybrid vehicles, plug-in electric vehicles and hydrogen vehicles. Vehicles using alternative fuels such as ethanol flexible-fuel vehicles and natural gas vehicles are also gaining popularity in some countries. The carriage of vehicles with an internal combustion engine is subject to the provisions of the International Maritime Dangerous Goods (IMDG) code. The UN number of such vehicles is 3166 and they are classified as Class 9. 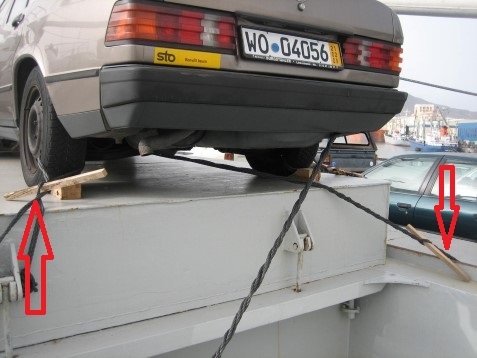 Before shipping vehicles, the appropriate sections of the IMDG code should be consulted. In addition to the international (IMDG code) regulations, country specific regulations may be applicable. Those country specific regulations should be consulted prior to shipment. Vehicles are primarily transferred onto the means of transport on their own wheels via ramps (roll-on/roll-off (ro-ro) ships, ferries and combined container/ro-ro ships, car carriers, auto freight cars). Damage often arises due to incorrect cargo handling during loading and unloading of the means of transport and while the vehicles are being driven around the storage lot (speeding, collisions). The IMDG code or country specific regulations should be consulted amongst others as regards the allowed quantities of fuel ( or other dangerous substances) remaining in vehicles tanks or receptacles ( such as lubrication oil, hydraulic oil or brake fluid reservoirs). When LPG/LNG powered than a “gas free” certificate, related to the tank contents, to be supplied. Both battery cables are disconnected or fitted with battery terminal insulators. Cargo securing is basically dependent upon the weight and type of vehicle and where it is stowed. The manufacturer’s loading and lashing instructions must be complied with. Vehicles are generally fitted with suspension, which means that the chassis may move independent from the wheels and wheel shafts. Care must be taken to ensure that the spacing left between the individual vehicles is sufficient to prevent them from damaging each other due to their differing vibration behaviours of chassis and to allow appropriate cargo securing to be applied. Lashing and securing of vehicles with a suspension requires care. It is important that a static condition of the chassis is achieved, for example by pulling the chassis frame down and compressing the springs. This can be done by vertical up / down lashings, or by releasing the air pressure of the air suspensions. A static chassis can be used to attach lashings to for example to strong chassis components or towage hooks. In case no static condition of the chassis can be obtained ( or maintained throughout transport), the wheels, wheel shafts or springs are effective parts to attach lashings to. The wheels of a vehicle should be prevented from moving for example by applying the parking brake, engaging the (first) gear or by placing chocks and wedges at the wheels. in the case of vehicles with an automatic transmission, the park position should be selected. The steering lock must be engaged. Ropes ( Hercules wires) or web lashings are customary equipment to lash and secure vehicles. Were web lashings are usually fitted with dedicated tensioning tools, Hercules wires are tightened by means of a timber or metal bar (swivel stick).